Founded in 1987 by Captain Jeff Federko, Orca Charters has become one of Lake Ontario’s most respected Charter and Guide services. Based out of Pulaski, NY, Orca Charters offers Lake Fishing, River Fishing, Wading Trips or can build a custom trip to create an experience you will not soon forget. Fishing with his Dad and brothers since the age of 6, Captain Jeff has many years of fishing in a variety of locations throughout New York State and the Northeast. His love for the Salmon River and tributaries began in 1972 and after his first trip on Lake Ontario in 1984 he started writing his future as a charter captain. As an experienced guide, trained in First Aid & CPR, Captain Jeff has safely completed hundreds of successful charters on Lake Ontario and throughout the region. 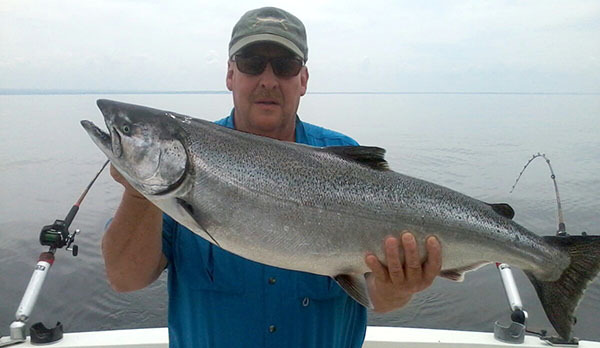 Captian Jeff is a New York State licensed fishing guide and holds a United States Coast Guard License. Captain Jeff leverages the latest electronics and gear to enhance the experience of each client. Rain or shine, you can find Captain Jeff on the water. His dedication and experience makes him one of the most sought after guides in the Pulaski & Salmon River area. He is known for a “no nonsense” and “gimmick free” approach to fishing and has a reputation as being an authentic master of the sport. Most trips start at one of the several docks he owns or at a pre-designated meeting spot. Following a short orientation and safety briefing clients are on the water and ready for a great day of fishing on Lake Ontario or one of the nearby rivers. With a fleet of boats, Captain Jeff has the flexibility to provide trips depending on the client’s goals, skill level and fishing conditions. It is very seldom trips end without fish to clean and pack for clients. If you have questions or are ready to book your trip with us, click here or call Captain Jeff today (607) 759-1674.